** Contingency Plan in case of bad weather: All games will be ball hockey games played at the Alton Legopn at the same times as above. The Classic is a spectator sport! With free admission and parking, you can catch all the action outside or from the warmth of the beautiful Paul Morin Gallery that overlooks the millpond. Come and cheer on your favourite players and team, enjoy food and beverages, enjoy the outdoor fire or warm up inside the beautiful Alton Mill Arts Centre. The Classic is a fundraiser! Voluntary donations of $2/person or $5/family are gratefully accepted. 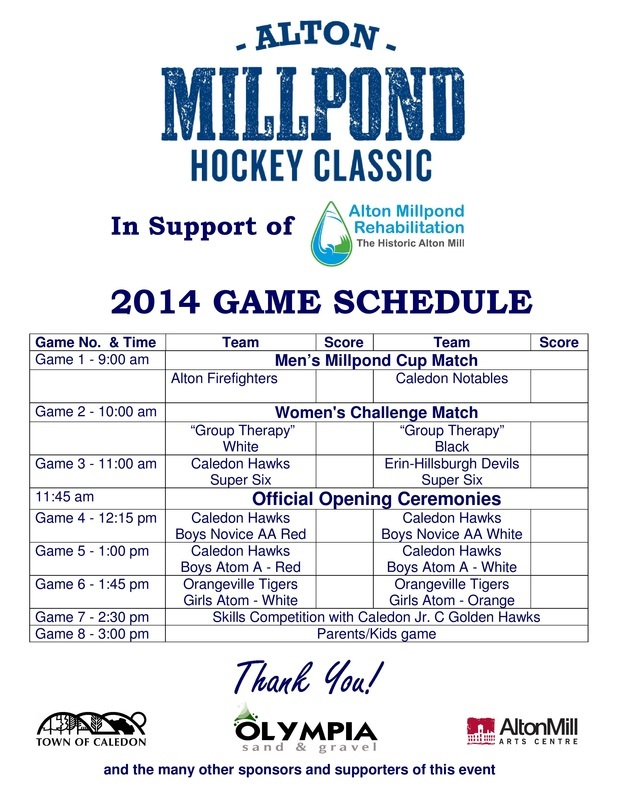 Your donation will help the cause... to rehabilitate the millpond. ﻿Bring your wallet! ﻿A cash bar and barbecue are featured throughout the middle part of the day.